Following the example of the “Society Rooms” of the late 1600’s and the Clapham Circle of the early 1800’s, Q Society Rooms are designed to gather your small group of leaders to dialogue, learn, and work together to explore how to express the Christian faith in a post-Christian culture. A Participant’s Book, Leader’s DVD and Guide, and a group project complete the Q Society experience, which will challenge your and every other participant’s innermost beliefs and pre-conceived ideas about life, faith, the world, and cultural responsibility. 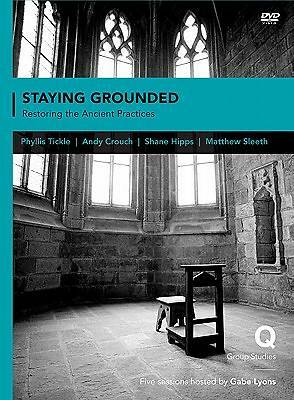 In Staying Grounded in a Shifting World: Rediscovering the Practices of Our Faith, host Gabe Lyons and DVD presenters Phyllis Tickle, Shane Hipps, and Matthew Sleeth delve into ancient practices of Christianity and the importance of bringing them into the 21st century. Discover traditions and habits that you can bring into your daily life, which will invigorate your passion for Jesus’ mission and bring back the joy and peace of living in communion with God. Lyons and Herbst then help you and the group explore—through short articles by noted authors, transcripts from Q Talks (included in the Leader’s DVD and Guide), five meetings to discuss important topics related to the overall theme, and thought-provoking questions— a study on Christian practices and how they can solidify a godly foundation for living.